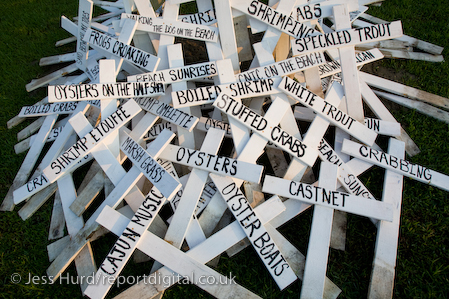 Crosses form a protest against the Gulf of Mexico BP oil spill. Grand Isle, Louisiana. USA. © Jess Hurd/reportdigital.co.uk Tel: 01789-262151/07831-121483 info@reportdigital.co.uk NUJ recommended terms & conditions apply. Moral rights asserted under Copyright Designs & Patents Act 1988. Credit is required. No part of this photo to be stored, reproduced, manipulated or transmitted by any means without permission.